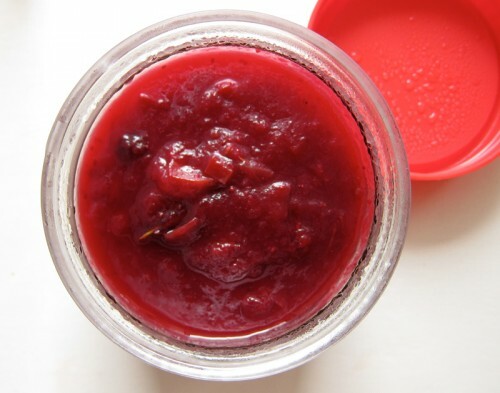 I love Thanksgiving mainly because it gives me a reason to make cranberry sauce. 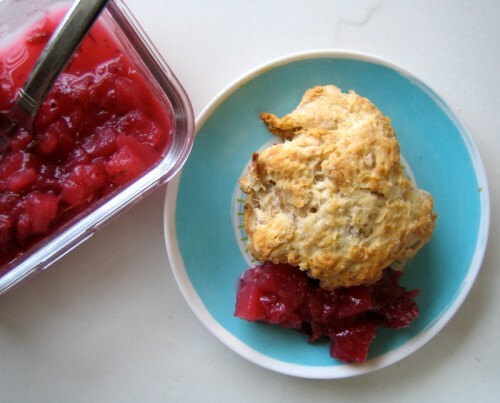 It’s stupid really, since cranberry sauce makes a great accompaniment to most meals and there are so many variations that it’s easy to whip some up any old time. Normally, I make a cranberry chutney that combines both sweet and savoury elements. But this Thanksgiving I wanted to replicate a version that my friend had made last year, one with apples and rosemary. Naturally, it went well with turkey, but it also tasted pretty amazing with a biscuit or a scone. I wanted that taste again! And because this weekend was our Thanksgiving holiday, I whipped up this easy little sauce to go alongside our dinner. It’s tart, it’s sweet and it has a wonderful pungent pine-y taste from the fresh rosemary. This recipe uses only a half bag of cranberries, so if you are cooking for a crowd, feel free to double up the recipe. However, you can just freeze the remaining berries and use the leftovers to bake with (this blood orange & cranberry loaf is highly addictive). But I think I’ll stick to making some cranberry sauce for no other occasion than it’s a Wednesday! Or because I’m making macaroni and cheese and that cranberry sauce help to cut the richness. Or because I just feel like it. Rinse cranberries and pick through them, discarding the bad ones. In a medium sized saucepan combine the apples, cranberries, sugar, rosemary and water and give everything a big stir. Cook over med-high heat, stirring occasionally. When it comes to a boil, let it simmer until the mixture reduces and gets thick. Taste & stir in more sugar if you like your sauce a bit sweeter. Remove from heat, cool and store in a lidded jar in the fridge for about a week. My mouth is watering just looking at the pictures. I’ll definitely be making this recipe. Thanks. But really, I love this idea—I was apple-picking this weekend and looking for an applesauce recipe with a twist. This, especially with the rosemary, sounds scrumptious. I’m trying this recipe out this weekend. We brought home way too many apples from the orchard, and I think I’ve done apples twelve different ways this week. And the rosemary has taken over my backyard. Also, MUST tell you about the deliciousness I made for Thanksgiving! My relatives were cooking the requisite turkey, but as it was a generic grocery-store frozen bird (not free-range and organic and “happy” as I would have preferred), I opted to make my own centerpiece: a cheese- and bread-stuffed pumpkin. I took the recipe from the current issue of Edible Vancouver and used whole wheat Terra Bread, cave-aged Gruyere, and sauteed shallots, garlic, sage, and rosemary. You layer it all in the gutted pumpkin and pour some broth over it to moisten, then put the lid back on and bake it. OH. MY. GOD. To die for. I also made the Sage-Pepper Butter Crisps (basically savoury shortbread) from the same magazine, as well as a raw kale salad to balance things out ;). For dessert, I got some Farmhouse brie and local concord grapes. I was like, swooning in gastronomic delight, while my relatives barely touched any of it. But hey, more for me, right?! Cranberry sauce with mac and cheese…now THAT’s an idea… I could eat cranberry sauce constantly and I always freeze some cranberries in December to keep for the remaining months of the year. Good stuff. p.s. I did recently discover jarred lingonberry sauce at the supermarket in Ikea (don’t judge me LOL), which btw, is fantastic with cheddar cheese and crackers! We make a similar cranberry apple sauce every year for Thanksgiving (the only real reason for turkey is to have something to go with that sauce, I always say) and I love the idea of adding rosemary to the mix. It’s brilliant. I can’t wait to try it. Mix well and chill before serving. Can be served on shredded lettuce. It may not be the prettiest little canned salad, but it’s got a lot of delight packed into it. That, and Vitamin C.
I am the same way with cranberry sauce – I still have a bag of cranberries in the back of my freezer from last year around the holidays, when I said, “I’ll keep these and make cranberry sauce in the springtime!” Oops. My favorite cranberry sauce is with tangerines (or oranges, in a pinch), a few spices, and almonds. However, I can taste the rosemary-cranberry combination just by thinking about it, and I can’t imagine getting much better than that. I hope you had a great Thanksgiving! 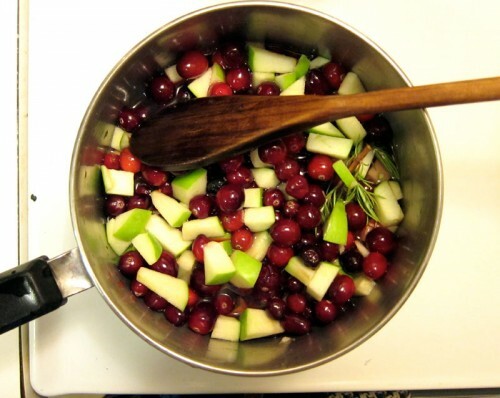 I love homemade cranberry sauce and apples can’t be wrong in it! It looks delicious! I had turkey at my in-laws this Thanksgiving. Where there was no cranberry in sight (gasp). However, you’re right. All this waiting for holidays, skulking off to Swiss Chalet in November to fill that cranberry gap between Thanksgiving and Christmas with the festive special..No, I’m going to be making this sauce just because I want to. That’s not true, I’m all talk, I’ll be making this sauce this week mostly because the apples kind of bump it out of the Turkey-only category. Gorgeous! Love the addition of rosemary. Can’t wait to try this!! do it maddie! i’m sure it would be delicious. no time like the present! bijoux, i’ve never tasted the canned stuff (thankfully). give this a try or try my more savory version that i linked to. it will banish those canned thoughts for good. really! thanks jess, yes, add rosemary! it adds extra depth. thanks liz! i’ve never tried canned sauce before, but i’ve made a similar version using fresh cranberries, orange juice & zest and cinnamon. love the addition of walnuts! margie, i’ve got to add nuts next time it seems! sounds delicious. thanks eva, i did have a great thanksgiving and hope that yours was just as delightful! thanks sarena, it was really tasty. can’t go wrong with cranberries! no cranberries, haley? a shocker! haha, yes, the apples do make it much more of an any day kind of sauce. too funny. This looks like my idea of heaven! Thank you for sharing. Thanks Kasey, I’m actually eating some right now over some millet and roasted vegetables and it’s delicious. Newlywed, thanks! It’s very good. I love the addition of rosemary! I will have to try this before our plant freezes. Gemma, do give it a go. It adds a good woodiness that I’m sure you’ll love. The addition of rosemary sounds like it would be really good! I’ve never tried that. And how interesting to think to pair cranberry sauce with mac and cheese. Now I want to try that!